Funny Car Chaos and Mo-Kan Dragway are proud to announce a new and exciting marketing partnership with Decades of Wheels as title sponsor of Funny Car Chaos on April 26th and 27th in Asbury, Missouri! In addition, the affiliated Café on the Route, Rita's Roost and brand new Little Brick Inn bed and breakfast serve as the official pre-party location and host hotel accommodation for the weekend, all located just miles from Mo-Kan Dragway in Baxter Springs, Kansas. The Decades of Wheels museum is a tribute to beloved cars and motorcycles throughout history, from Model T’s and Hellcat Chargers to vintage Corvettes and a ‘71 Husqvarna owned by Steve McQueen. A 290+ vehicle personal collection of a private citizen is being turned into the Decades of Wheels museum. The museum sits on Route 66 and is dedicated to the preservation of the history of this iconic highway as well as the golden age of automotive history. Their rotating display of vehicles and motorcycles, you’ll find representatives from the very beginning of automotive history to the latest, leading-edge vehicles of today. It’s all there, including historically significant cars and motorcycles, muscle/performance cars, and classic cars. They've got movie cars that make a big statement too, like Herbie the Lovebug, the Black Beauty from Green Hornet, Dragula and The Munsters coach, the Back to the Future DeLorean, the Ghostbusters car, and multiple Batmobiles. Along with the impressive museum, additional attractions on the property are sure to satisfy the eating and sleeping needs of Funny Car Chaos racers and Mo-Kan Dragway fans! The Café on the Route will serve as the official Funny Car Chaos pre-party dinner location where participating cars will be on display, Thursday evening on April 25th. The pre-party is a fantastic opportunity to see funny cars up close and personal, meet competing drivers and enjoy a fine meal with your hot rod loving friends and family before race weekend starts. Dinner festivities will be followed up by happy hour and socializing at Rita's Roost just a block away within walking distance and will last through the evening. This special evening of high horsepower excitement is open to the public as we encourage all event participants and local racing and automotive enthusiasts to experience and enjoy all the amenities available in the impressive Decades of Wheels facilities. Luxury accommodations are also supplied by the newly constructed Little Brick Inn bed and breakfast which will be "the place to stay" for Funny Car Chaos teams and fans traveling to the event. No stops were taken in the unique designs and top tier comfort you'll enjoy with your stay at the Little Brick Inn. Rooms are limited, so don’t wait to reserve your room at a spectacular Thursday through Saturday rate of just $89 per night which includes two breakfasts per room. Reservations can be made starting on Monday, February 25th. Funny Car Chaos and Mo-Kan Dragway are thrilled to be working with Decades of Wheels and their affiliate businesses to supply our racers and fans with a turnkey hospitality experience not only on race weekend, but throughout the year. Travelers along historic Route 66 heading to Funny Car Chaos or other Mo-Kan Dragway events can also enjoy these unique and lively amenities year round! You can find out more about Decades of Wheels by visiting their website www.decadesofwheels.com. 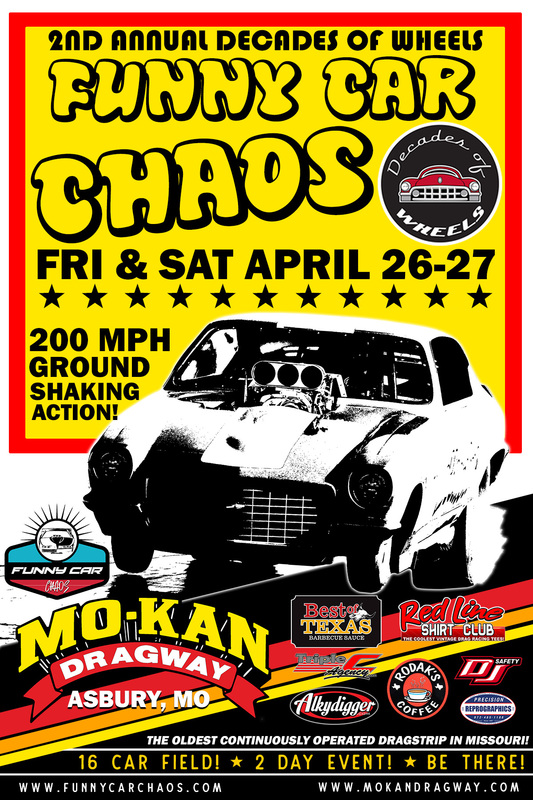 Make your plans folks, this is going to be an action packed race weekend like never before at Mo-Kan Dragway as Funny Car Chaos festivities start Thursday, April 25th in Baxter Springs then continue Friday and Saturday, April 26-27th at Mo-Kan Dragway! BE THERE!